The point where two bones connect in your body is called a joint. When these areas are damaged due to disease or injury it can cause a lot of pain and inflammation. When your body is injured, its natural response is to bring extra blood to the area as it tries to replace damaged cells. However, extra blood in the injured or irritated area can also cause inflammation and swelling. Swelling and inflammation can often be resolved with ice, rest, and over the counter medication. If these conservative treatments don’t work, your physician may recommend one or more joint injections to help your body heal or to ease your daily pain by reducing the inflammation. Getting a joint injection is a safe outpatient procedure, and the injection only takes a few minutes. The procedure starts with a local anesthetic, providing immediate pain relief to the area. This is followed by a corticosteroid (a steroid medication), which decreases inflammation and swelling in the affected joint to provide longer-term pain relief. 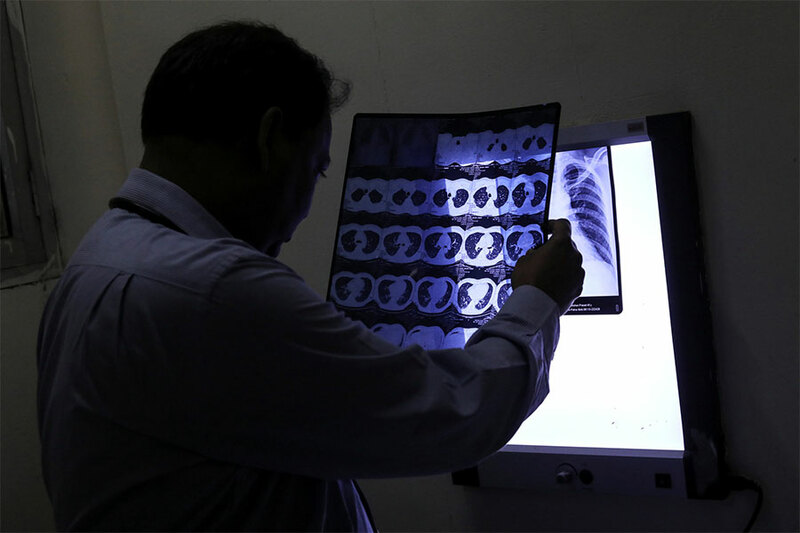 Your physician may also use fluoroscopy imaging to ensure the medication is released in the right place. Injections last several months, sometimes longer, and can be repeated safely a few times a year for chronic conditions. Joint injections do not resolve the original problem, but they can help break the cycle of inflammation and pain. This can be especially helpful for joints used daily, that aren’t or cannot be given enough time to recuperate before being used again. The Corticosteroid keeps the inflammation down, allowing your body time to heal and strengthen with less pain. 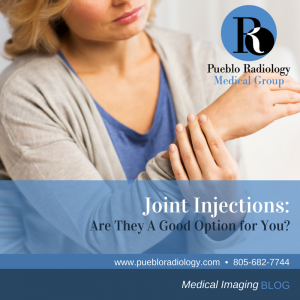 If you have been having prolonged pain in a joint, call us today at 805-682-7744 to see if joint injections are a good option for you. Pueblo Radiology has subspecialized Radiologists available to perform these pain-relieving procedures. Our patients’ care and comfort are our top priorities, and by combining the use of fluoroscopy imaging and skillful staff, we provide optimal pain relief to our patients for the greatest length of time.